The “Trigger” is non-symmetrical tri-blader with the typical MTA-flight performances, it was special developed for sure catch after every one throw and a sure score in MTA100 and SuperCatch competition events. The shape is a result of long optimization -30 prototypes were made and tested (Nov. 2001-March 2002) before the serial manufacturing start. 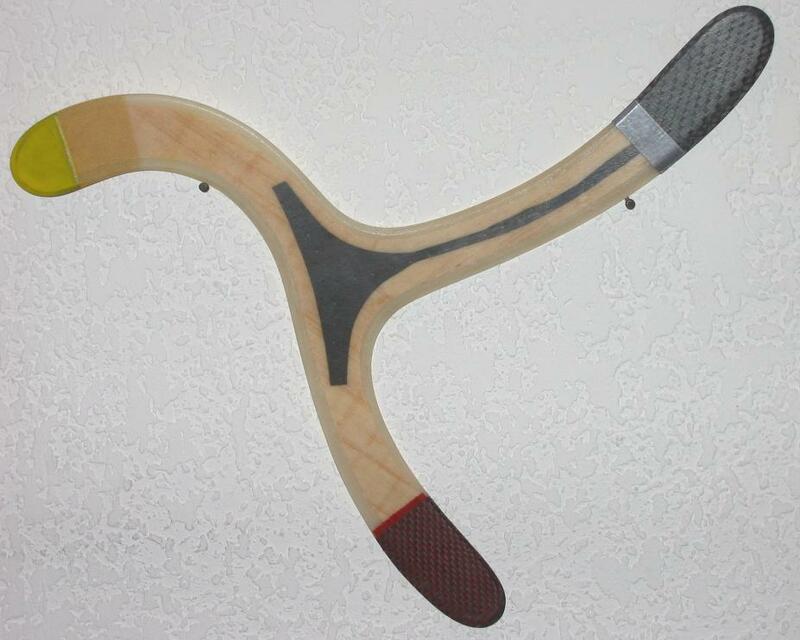 The arm-profiling is a revolution in the multi-blader-boomerang design. Thanks to that, the Trigger flight performances are unique - it forgives throwing-faults, takes a horizontal position at the end of the climbing without any stall-symptoms and hovers without contra-rotation during the hover (in German Ausdrehen). 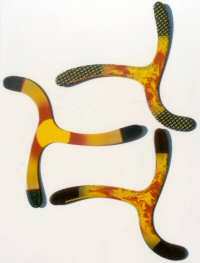 And because the Trigger is a tri-blader  it is much more sure for catching. 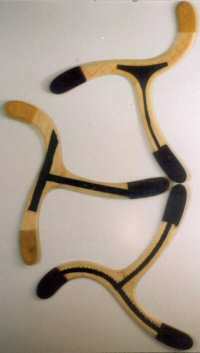 The premiere of the Trigger held on the World Boomerang Championship in Kiel, Germany (29.07.-09.08.2002).Many throwers from the USA, Switzerland, Germany, Japan and Australia used successful Trigger in the SuperCatch and MTA100 events. * Michael Gel Girvin / Team Gel Awards 2002: Georgi Dimantchev - WBC to Bulgarian aerospace arms of boomerang connection award and saviour of SuperCatch MTA award for three Dogs of Boom. 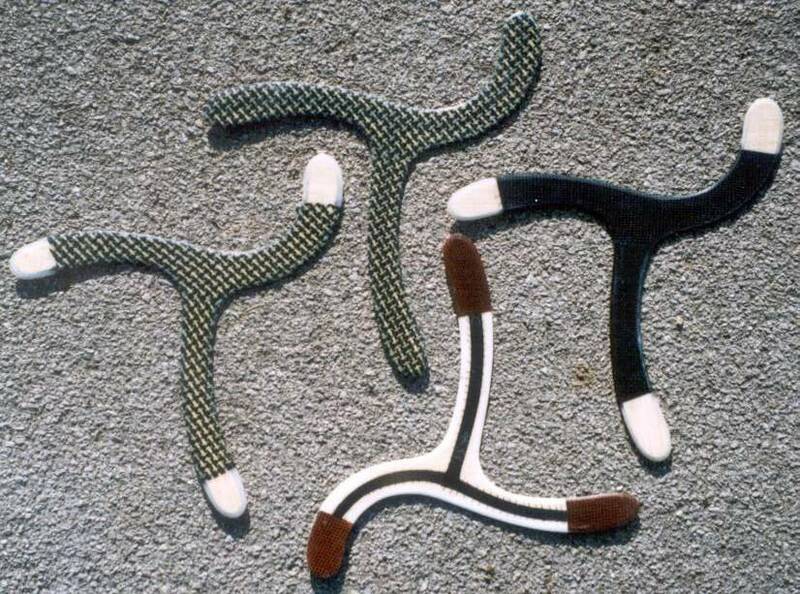 "Everyone at the 2003 Gateway Classic in St Louis was very impressed with the "Trigger"! Matt Golenor has a very strong arm! He threw his "Trigger" (27 gram/2002) very high and of course it laid flat and stabilized immediately. Same for my "Trigger UL" (20 gram/2003), except I do not have the "cannon" arm that Matt has."